Every caravan (hopefully) has a highlight or two. It might be the list of equipment for offroad touring, or the particularly innovative chassis design. Sometimes it’s the shape of the van that appeals. And sometimes it’s something else entirely. 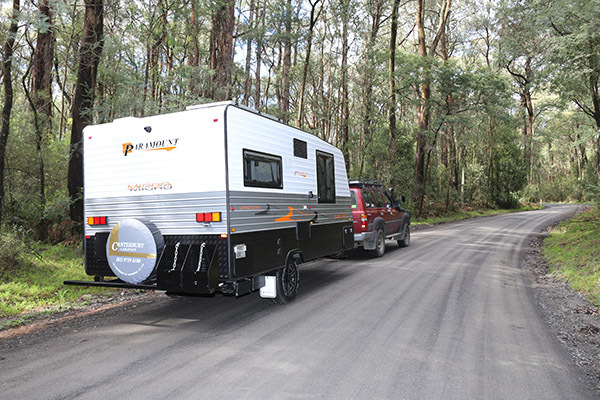 The Paramount Micro 15ft 6in was built just in time to be launched at this year’s Queensland caravan show where, I’m told, three were sold in short order. But what is the highlight of the Micro? What feature or aspect will bring customers back for a second look? For me, it’s undoubtedly the layout. The fundamentals of the van, from chassis to suspension to frame, are sound, but the layout is bordering on spectacular. If ‘spectacular’ seems an exaggeration, ‘impressive’ might be a better word. Rather than accept the limitations of a 15ft 6in internal length, it’s as though Paramount saw them as a challenge. Equipped with a combo bathroom, decent kitchen, small but functional dinette and island bed, along with sensibly arranged storage, the Micro balances form and function particularly well. You might assume that the result, given the van’s cabin length, is a cramped caravan; however, for two people, the Micro’s layout ticks all the right boxes. The only genuine compromise concerns nearside access to the queen-size bed. You see, the bulkhead on the left of the entryway encroaches on the bed, making it awkward to squeeze past. Not impossible, mind you. The rest of the bedroom is quite pleasing, with three cupboards above the bed and a wardrobe either side – there’s a storage nook recessed into each wardrobe, too, so you’ve got somewhere to put your book once your eyes have grown heavy. Paramount has even fitted a speaker inside each of these compartments to complement the two in the main cabin. The cupboard at the foot of the bed on the offside contains a new piece of gear: the control box for the so-called Tow Secure break-away emergency braking system. As you know, all trailers over 2000kg GTM must be fitted with break-away brakes, but New South Wales complicates the matter by requiring the tow vehicle to be fitted with a monitor, visible from the driver’s seat, that indicates the state of charge of the trailer’s battery (so as to operate the break-away brakes). The beauty of the Tow Secure, supplied by Coast to Coast, is that it comes with a wireless receiver for the tow vehicle’s dash. The control module performs a self-test each time the vehicle’s engine is started to ensure it all works, and when towing it automatically conducts a battery test every 30 minutes. This device solves a problem that has perplexed vanners of the Premier State for some years. An upgraded 184L three-way fridge-freezer (a 128L unit is standard) separates the bedroom from the dinette while a storage locker is above and below the fridge. Behind it, meanwhile, is the corner dinette, which is more spacious than you might believe. Above are three lockers while the storage space beneath the seats can be accessed by drawers, which, I might add, makes complete sense. If you’ve ever wrestled with seat cushions trying to get to your stuff underneath, you’ll understand. A couple of LED reading lights and an NCE stereo/DVD player built into the overhead cabinetry complete the picture in the dinette. Across the back of the van, the bathroom is a fully-moulded unit, with no joins to minimise the potential for leaks, complete with a Thetford bench-style cassette toilet, small washbasin moulded in behind, 12V fan hatch, and hand-held shower. The nearside kitchen mightn’t have the most bench space you’ve ever seen but it’s functional and there’s lots of storage on offer. Features include a Thetford Minigrill Mk II, a stainless steel sink and rangehood, Sphere microwave, a wide, two-shelf, pull-out pantry, a pots drawer and a range of other storage options. A Projecta battery monitor is fitted in a locker above the rangehood, along with a 12/24V 30A solar controller (a 150W panel is fitted to the roof as an option) and the switch for the Atwood gas-electric hot water service. Other features include a TV on a swivel arm at the base of the bed, reasonable storage space under the bed, and an Aircommand Ibis 3 air-conditioner. All in all, it’s a thoughtful layout that packs in many good ideas and features. The cabin exit points for the plumbing under the sink was a little splintery but I’m picking nits here. I really liked the Paramount Micro. Behind my 80 Series, Ruby, the Micro was very well behaved from the moment I picked it up from the Canterbury Caravans in Bayswater. It’s not an offroad van but I did tow it on some smooth gravel tracks as part of my test and it performed well. Our test van was fitted with a number of upgraded features and options, and overall, it represents good value for money. With the Micro 15ft 6in, Paramount has come up with an attractive proposition for couples who don’t want or need a 24ft luxury rig but who don’t want to forgo certain comforts. Really, this van wants for very little.